Once your medicines regulator decides it should change the side effects warnings on the patient information of a drug taken by millions of people, how long do you think it would take for that change to be implemented? Everyone likes to be informed, and many people make an informed decision to stop taking statins, because of well-documented side effects such as muscle problems. What were the MHRA going to put on the new labels? “Patients should be made aware that treatment with any statin may sometimes be associated with depression, sleep disturbances, memory loss, and sexual dysfunction.” They also planned a new warning to explain that – very rarely – statin therapy might be associated with interstitial lung disease. Now before we go any further, we should be clear on one thing. There are lots of people out there who want to tell you that statins do more harm than good, and many of these people have vitamin pills and magic diet books to sell. Back in the real world, the evidence shows that statins are effective: they reduce your risk of having a heart attack, and your risk of death over a given time period, but they reduce these risks as a proportion of your pre-existing risk, so if you are at high risk of having a heart attack to start with, a statin is more worthwhile than if you’re only moderate risk. Although of course you still have to decide if you’re the kind of person who feels enthusiastic about taking a preventive drug every day for years on end. And we should also remember that some of these new side effects, like many of the zillions of side effects listed on patient leaflets – often in an unhelpful and unranked barrage of information – are only weakly associated with the drug. These are warning notices, and some of them are based on circumstantial evidence, speculation, and preliminary data. But this side effects information is made available for all drugs, because it’s strong enough to be worth sharing, because it might be useful to somebody somewhere, because it might make doctors more inclined to take a specific side effect more seriously from patients, because they might act as a focus for more detailed quantitative work, and so on. This is not the new thalidomide, and it is not a story about how statins are a hidden killer: this is, rather, a story about how risk information is disseminated to patients and doctors, and how it can be disappeared. Because the decision to add these new side effects to the label was made in February 2008, and they still haven’t appeared. When will they make it onto the label? Soon. Hopefully. It has taken until November 2009, and the implementation has just been announced, a full 21 months later. So a drug company has been able to delay the inclusion of safety warnings on a drug prescribed to 4 million people, for 21 months, because they didn’t agree with the wording. There is no conceivable world in which this is a good thing. Its not very surprising that 100% of people who have reported side effects have experienced side effects. Your report seems like alot of anecdotal evidence from a self selecting group. It doesn’t really consitute strong evidence. Sorry. Perhaps you have misunderstood. Every single patient on a statin had experienced side effects. Now we are told that side effects are rare and that serious side effects are very rare. I cite the incidence of amyotrophic lateral sclerosis as 1:200,000 according to the Neurology research paper and in 351 cases there were 18 incidents. I explained and acknowledged the limitations of an informal report and you seem to have missed that five paragraphs which appeared immediately after the background information. Notwithstanding that, your comment is unworthy of a clinician, if that is your work: I don’t suppose that 18 people gave themselves ALS in order to become part of a self-selected group for the purpose of completing a survey telling the world how they have developed a progressive and fatal condition. As for your apology, it is as irrelevant as you so obviously are. These are ordinary people reporting what has happened to them. The report is designed to inform you, not to massage your huge ego and permit you to feel superior to anyone who is not you. I sincerely hope you that never develop ALS or any other iatrogenic debilitating and progressive disease for that matter and hopefully, you wont hear someone else pass a similar judgement on the rationale with which you would want to inform others. AH: Settle down and stop referring to yourself in the 3rd person. AH: Pop yourself a statin before you have a heart attack. Obviously I’ve upset you , I’m sorry for that , and I didnt mean to belittle your report which must have taken an enormous amount of time and effort. That however doesn’t make it strong evidence. i’ve had an inkling for a while that you may have experienced personally some of the statin side effects that you mention? The fact that they are rare isn’t any consolation to the people who get them. However being personally affected doesn’t make one the best candidate for appraising their worth. What if the drug company was RIGHT??? I work for a drug company and I know the kind of thing that the MHRA and its sister agencies around the world want us to put on “product labels”. e.g. a certain disease causes some patients dizziness. Some patients with that disease who are taking your product report dizziness in a clinical trial. There’s no evidence that the drug causes the dizziness, the patients would have got it anyway, even if they were on placebo. But the agencies want you to write “MAY CAUSE DIZZINESS – CAUTION: DO NOT DRIVE OR OPERATE MACHINERY… etc.” on your patient information leaflet. The trouble is, the drug industry is not generally allowed to talk to patients about the benefits of their products. Patients are too stupid to understand, so companies can only talk to doctors about the good stuff. However in the patient leaflet we have to breeze over the potentially life-saving “benefits” section in a trice and then list out a whole range of low level, rare side effects in enormous detail. Knowing the human mind’s capacity for making risk:benefit judgements, that makes all drugs seem so evil that patients who are prescribed them frankly are frightened to take them. That is why a pharma company might have objected to the decision of the agencies. Dear Ben: by a method that escapes me you figured out my identity and suggest I have a colourful website [thank you] about the “magical healing power of vitamin pills”. First: it deals with micro-nutrients, including vitamins, and its subtitle is ’cause and prevention”, not “healing” heart disease, although there is evidence for that. This >10 year old not-for-profit site sells nothing but provides free info. Looking at our motives and backgrounds, we clearly have more in common that what divides us. I missed your analysis of JUPITER so if you have a link, please. This DISTRACTION from the subject at hand was NOT my choice which is why I used a variation of my name. The name of the website is “Nutrition, Health & Heart Disease; Cause & Prevention”. It is after having looked the matter of ’cause’ for decades that I was forced into dealing with the fallacy of cholesterol. I’d agree with our host that the ‘supplement business’ is no more ethical than Pharma and they are joined at the hip. ‘Vitamins’ are basically controlled by Bayer, Roche and some other Pharmas, and the Chinese. Micro-nutrients, however, can and do affect ’cause’. Moreover, probably less than 1 American/year dies from the IMproper use of ‘vitamins’ versus 1 each and every 5 minutes in a hospital setting from the PROPER use of drugs [reported JAMA]. Pick your cure, or windmill. Let’s debate ‘vitamins’ when NOT talking statins. 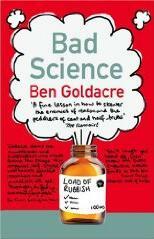 Ben: your next BadScience target has to be that NICE document! TRG: Four occurrences of the first person singular. TRG: Dear me, what an unpleasant character you are. Thanks for the apology. I must have seemed a bit prickly and I apologise for being hypersensitive. Of course, the whole point of the report was that it was not the hard data of a fully controlled, double blind research study. The anecdotal accounts were just self-reported experiences. The fundamental question remains: should those anecdotal accounts be ignored because they were not the numbers collected by Pfizer or Merck inspired and funded research? I happen to think that clinicians should not ignore those accounts. They were remarkably congruent and consistent with each other. What it leaves is a summary of the personal accounts (the soft-edged numbers) and an uncomfortable feeling that adverse reactions are more common than supposed hitherto. The incidence of ALS, for example, is not on all fours with what is known about ALS. The MND association in the UK puts the incidence of ALS/MND at 2 cases per 100,000so 18 cases still looks too high, to my mind. How can we explain the anomaly? The total of neurological adverse reactions was confirmation that inhibition of Dolichols, Heme A, Coenzyme Q10 and prenylated proteins is not a good thing. The science does not support the notion that cholesterol is the principle actor in cardiovascular disease, and it never did,save in the minds of Ancel Keys and Dr William Kannel. I would like to commend the work of Professor Bruce Ames and his co-workers to you. His work is illuminating in the field of Mitochondrial oxidative decay and apoptosis. his understanding of Heme A depletion is second to none and it underpins the inability of the cells to derive energy from the food we eat. Low cholesterol predicts higher mortality than high cholesterol. I have never taken a statin (too long a story for this blog) and I have not yet developed CHD. Of course I avoid visiting my family medical practitioner because he wont like my 8.8 total cholesterol or my mild hypertension nor will he like my high fat, low carbohydrate diet. It has helped me to lose weight without even trying. In turn, I wont be medicated needlessly or because of government targets. Blanket Rx for whole populations is not the practice of medicine but it is most assuredly the practice of the expedient and one would hope that the medical profession is much better than that. You know how it is when you’re settling to accepting somebody’s line, and then, right at the end, they blow it? If I collect bivariate data and you find out I ditched half before correlating, you have no usable information. (Not strictly true when you know which corner of the plot I ditched, but let’s not quibble.) However, if I ditch identifiable cohorts of data, the logic is quite different. 1. In the Seven Countries, there is a positive correlation between high fat and heart disease. 2. High fat/cholesterol is not the principal cause of heart disease. 3. Whatever the real principal cause is, it afflicts the populations of the Seven Countries. 4. When the principal cause is present, high fat/cholesterol exacerbates its effects. Or he is deliberately perverse. Quite separately, I have trouble reconciling his statement that statins are completely ineffective (as supported by Erenard) with Skyesteve’s “the number of heart attacks and strokes in our practice has plummeted … since we started using statins on a widespread basis”. So, while I could accept The rim groper’s arguments about “side” effects and wrong reporting of statins, I’m wary of accepting his whole story. I was prescribed statins, the side effects were horrific, muscle pain, diarrhea, insomnia – this all stopped when I stopped taking the statins. I read the Great Cholesterol Con by Dr Malcolm Kendrick, who convincingly argues, with studies and stats to back up his case, that there is no link between high cholesterol and heart disease anyway, and this has been pushed by Big Pharma to increase sales of statins. In any case, the side-effects were horrible, I’ll take the risk with slightly high cholesterol.